This is the next Pokemon on the VERY LONG “To Do” list that my daughter gave me at Christmas time. Magikarp is, inmy opinion, one of most useless Pokemon have even been developed. The goal with anyone playing the game is evolve Magikarp to Fyarados as quickly as possible. 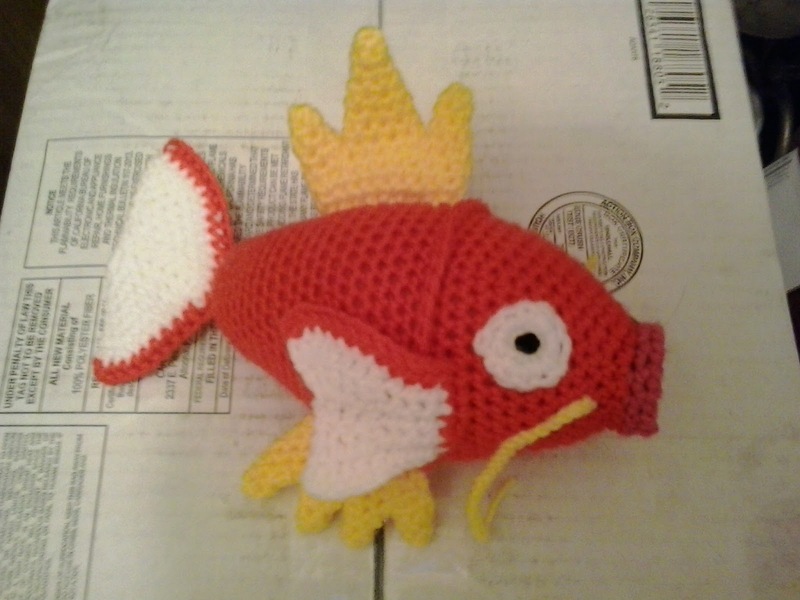 This pattern includes the color list for both Magikarp and Shiny Magikarp. Worsted Weight Yarn (Shiny color substitute in parenthesis): Orange (Gold), yellow, white, black, and passion pink (pale yellow). Finish off leaving a long tail. Weave tail through sc of Rd 33, pull tightly and secure. Weave in ends. Rw 1: Starting in first dc of Rw 5 of SIDE FIN, attach orange, ch 1, 2 sc in same sc as attachment, sc in next 10 sc, working in side of Rws of SIDE FIN, sc in next 3 Rws, sc2tog. Finish off leaving a long tail. Sew SIDE FINS to BODY. Rd 1: Fold TAIL in half. Working through both thicknesses, attach orange, ch 1, 2 sc in same sc as attachment, sc in next 21, 2 sc in next sc. Finish off. Weave in ends. Sew TAIL to BODY. Finish off in first TOP FIN SMALL POINT. DO NOT FINISH IN SECOND TOP FIN DMALL POINT. Finish off leaving a long tail. Sew TOP FIN to BODY. Finish off in first 3 BOTTOM FIN SMALL POINTS. DO NOT FINISH IN FOURTH TOP FIN DMALL POINT. Finish off leaving a long tail. Sew BOTTOM FIN to BODY. Finish off leaving a long tail. Sew EYES to BODY. Using black, embroider pupils on EYES. With yellow, ch 20. Finish off leaving a long tail. Sew WHISKERS to BODY. Magikarp, Shiny Magikarp, Gyarados and Pokemon are copyright Nintendo and their respective creators. This pattern is an original pattern and is © by Christjan Bee (November 2017). Please do not claim this pattern as your own. If you wish to share this pattern, you may link to this pattern but please do not reprint it on your site. You may keep a copy for your own personal use but you may not sell or distribute it, or sell items made from this pattern.